The following archive is a collection of records, logs, and intercepted communications. Selections of this document have been retrieved or created through esoteric means, the nature of which has rendered the archive difficult to control. Information retrieval specialists have attempted in this archive to provide the clearest possible history of POI-1844. Certain events described in this document may be presented out of order, or in contradictory ways. This does not mean they did not happen. 7:00 AM: Moments before dawn, a luxury De Dion Bouton motor-car speeds through the forest, still snow-capped in the early spring, travelling to the Mediterranean coast. 7:03 AM: The driver, a chauffeur of Marquis de Dion, notices an obstruction on the road ahead. He notifies his companion in the passenger seat, who suggests the road may be damaged or closed. The limousine comes to a stop in front of two horse-carts, blocking the road. Before they can react, two men, each armed with a Browning semi-automatic, emerge from the flanks. 7:04 AM: One of the assailants introduces himself, and informs the driver that the car is no longer his. The driver draws his weapon, but is shot. The passenger is shot four times. Both bodies are removed from the car, and left by the side of the road. Biography: Born in Seine-et-Marne, Garnier's unremarkable childhood quickly evolved into a radical communist adolescence. Garnier engaged in a steep procession from petty theft, to assault, and eventually to violations of orders both judicial and natural. Garnier's anarchist "gang", whether the papers call them "The Auto Bandits" or "The Bonnot Gang", poses a threat to the rule of law in civilized society. Their utilization of automobiles and state-of-the-art weapons has led them to largely outclass French police, as they plunder banks without resistance and inspire otherwise loyal workers into strike and rebellion. Foundation interference in Garnier's operations invariably results in failure, through the intervention of natural, thaumic, or logistic obstacles that are not ostensibly under Garnier's control. It is not known when Garnier became anomalous, or when the anomalous began to suit him. I hope my letter finds you well. I would like you to know that I hold the greatest respect for your actions. Your mere existence, the way you live, the way you act, is a subversion. A sabotage of the structures that divide and destroy us. I know how it feels to be against the grain of normalcy from the outset. That is why I am writing you. I possess many associates from all walks of life who exist in a superliminal state. They are invisible, they do not age, and there are many in society who do not tolerate their existence, and tolerate knowledge of their existence even less. I live in a place where all knowledge is held. Our security is sacred. Your actions offer us a path to secure our place in this world, once and for all. I hope you will give me the chance to explain. This world is not what the oppressors would like us to think. Tonight, fall asleep with this letter beneath your head. Tomorrow, you will understand what I ask of you. 9:00 AM: POI-1844 and his associates, André Soudy, Raymond Callemin, Étienne Monier, and René Valet approach the Société Générale Bank in Chantilly, driving the stolen limousine through the suburban landscape. 9:11 AM: A Foundation task force stationed within the bank's back room, positioned to intercept the Bonnot Gang should they choose this place to strike, are informed of the incoming vehicle and prepare to intervene. The limousine stops at the main square in front of the bank. POI-1844 and three associates proceed into the bank, while one provides cover from the sidewalk. The gang order the civilians inside to make way. The Foundation task force attempts to leave the back room, but find the door locked from the outside. 9:12 AM: Several bank tellers resist the gang's instructions. POI-1844 orders his men to open fire. Three people are shot. They proceed to the bank's safe, and begin collecting the money. The Foundation task force attempts to batter the door down, but begin hallucinating the appearance of a woman in the room with them, who interrupts them. The woman told the task force something that they were later unable or unwilling to recall. When she finished, the task force began to vomit live, non-venomous snakes. 9:22 AM: The gang retreat back to the limousine, where their associate had been covering by firing warning shots at passers by. The limousine takes off in the direction of Paris. Two policemen attempt to pursue by horseback and bicycle, but are easily outrun by the vehicle. 9:27 AM: The Foundation task force ceases vomiting snakes. All snakes in the room disappear, and the door is unlocked. 11:40 AM: The automobile is found, abandoned, on boulevard Pereire in Paris. Inside, police find clothes, bloodstained cloth, and a rifle used in the robbery. Foundation investigators find traces of intense residual thaumic energy imprinted in the limousine's trunk, but no source is found. A thaumic artifact is presumed missing, in POI-1844's possession. POI-1844 is upgraded from a potential instigator to an active, major threat to normalcy. It is not by accident that I offered my home to shelter your comrades on that night. As anarchists, it is our tendency, and perhaps our necessity, to let needs and requirements go unsaid, merely wordlessly fulfilled. It need not be said that my home is open to those who need to hide from the eyes of the police. That much is expected. I don't wish to bore you, nor waste time stating the obvious. What I mean to say is that there are things that go unseen, because the light of society would not bear to shine on them. They force us into the darkness, thinking us rats, and we learn to flourish in that night. They ask that we care for their banks, their belongings, their gold while the masses starve and freeze. You cannot reconcile this. So you hurt them. When I think on what I have done, and what I have yet to do, I wonder if it suits me. The obscurity forced upon us, the restraint of our minds and bodies. The withering of an ego that does not fit what those "above" wish for us. Have I become complacent, moderating my resistance from behind a typewriter? Already I have regrets. I do not wish to languish in the dark further. Our words cannot simply go unsaid anymore. When I see your actions, I see steps into the light, and I know that this darkness cannot persist. Your performance in Chantilly was exemplary. It was heartening to see not only how well you defied the odds, but also the implicit acceptance of what I had offered you that night, which feels like so long ago. In my home, we have novels of all kinds. Anyone there could tell you that all fiction, from epic poems to sultry romance stories, share common attributes. Form, and structure. Paths that are followed thousands, millions of times, anchoring their followers in common knowledge, understood structures, ideas that are innate to ourselves. The world is not so different from fiction. There is a narrative in our world. It is a story that some try to tell, louder than anyone else's. Their version of the world, of fiction, must be particular. They can restrict the quanta of stories, bar the world from exploring the innate ideas they possess from birth. They turn our world into a shadow of what it could be, make it a shallow puddle reflecting a vast, unending sky. I have seen the possibilities that await when we transcend these limiting elements. My family, my comrades, all wanderers long to live in that open air. You reject the basis of the Foundation's monomyth. You will see the world restructured into one unlimited realm, free of conflict, strife, and class. I understand that what I have asked of you is difficult, the most difficult thing a man can do. I regret that you were not able to visit our collection in person. 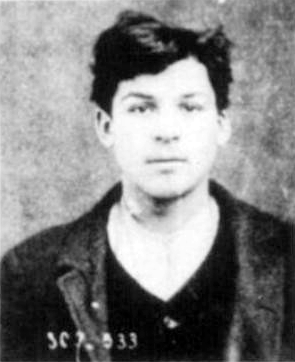 On March 30, André Soudy was arrested. He was later executed. On April 7, Raymond Callemin was arrested. He was later executed. On April 24, Étienne Monier was arrested. He was later executed. 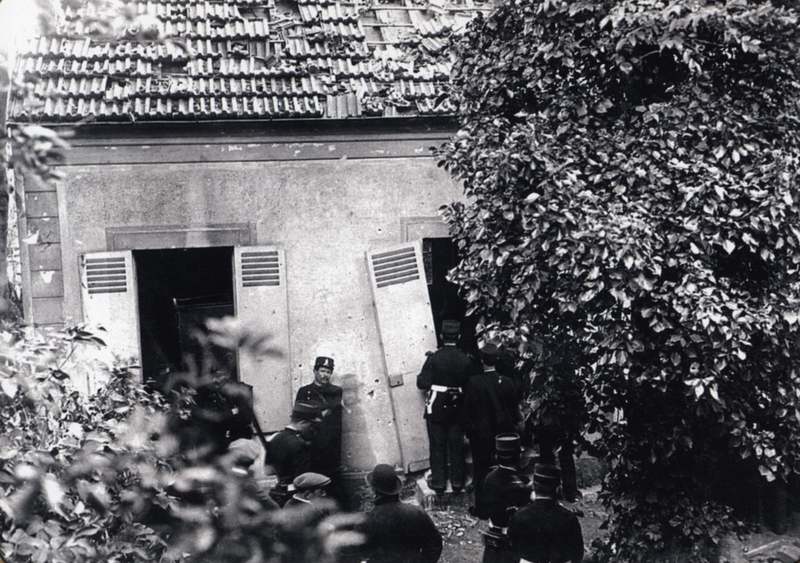 6:30 PM: French police surround a building in the commune of Nogent-sur-Marne in Paris. They believe POI-1844, along with René Valet, is holed up inside. The police announce their presence, and are answered by potshots from the windows. 8:30 PM: POI-1844, Valet, and the police continue to trade covering fire for an extended period of time. The crowd outside the building grows, police reinforcements burgeoning into the hundreds, not including civilian spectators. Foundation forces arrive to provide additional cover. Fearing the fallout of an immense thaumic attack should a cornered POI-1844 utilize the purported artifact from Chantilly to its fullest extent, Foundation counter-thaumic specialists from multiple Sites across Europe have been diverted to contain whatever results from this standoff. 10:30 PM: POI-1844 and Valet gather their stolen money and set it alight, destroying ten thousand francs. As the police lay down machine gun fire from outside the building, the two men retreat to the cellar. At approximately this time in the four largest Foundation sites in Europe, anomalous distortion is registered inside archival departments. Many volumes of documents and classified logs vanish. Others burst into flames, consuming whole wings of data before the fires can be contained. Meta-analysis of the surviving documents later reveals that the greatest gaps in knowledge are related to what might be an anomalous organization or place related to an intense concentration of literature. It is believed that this specific data has been anomalously obscured to the fullest extent, preventing the Foundation from comprehending or intercepting the organization or place in any part. 12:30 AM: Police lead a squad towards the building, planting explosive melanite charges. They retreat, and detonate the charges, shattering windows down the street and collapsing the building entirely. As the authorities charge into the remains of the building, they discover both POI-1844 and René Valet semi-conscious in the wreckage. Both are shot in the head. They are later buried in unmarked graves. On March 24th, 1912, the day before the robbery in Chantilly, a document was received by La Sûreté Nationale, addressed to the Chief of Police Xavier Guichard. Below is an excerpt. I declare Dieudonne to be innocent of the crime that you know full well I committed. I refute Rodriguez' allegations; I alone am guilty. And don't think I'm going to run away from your police; on my word, I believe they're the ones who are afraid. I know there will be an end to this struggle which has begun between me and the formidable arsenal at Society's disposal. I know that I will be beaten; I am the weakest. But I sincerely hope to make you pay dearly for your victory.